The Zimbabwe pastor who fled to the United States after launching the popular #ThisFlag protest movement faces up to 20 years in prison for organizing protests against President Robert Mugabe in New York. Evan Mawarire was arrested at Harare International Airport on his return home Wednesday. He is yet to appear in court. Mawarire has been charged with subverting a constitutionally elected government, which carries up to 20 years in prison. Lawyer Harrison Nkomo said the charges arise partly from his role in organizing anti-Mugabe protests during the U.N. General Assembly in September last year. FILE - Pastor Evan Mawarire leaves the Harare Magistrates Court, Zimbabwe, July 13, 2016, after the court freed him ruling that police violated his rights. Mawarire is accused of organizing Zimbabweans "to converge in New York to confront the president of Zimbabwe who was attending a United Nations seminar and order him to immediately resign from his position accusing him of destroying the country," according to a police statement seen by The Associated Press and confirmed by his lawyers Thursday. Mawarire also is accused of using social media to incite "violent demonstrations" between August and last month. He rallied Zimbabweans to protest against the government of Mugabe, who turns 93 this month and is the world's oldest head of state. On Thursday, he was given two more charges: inciting public violence and insulting the national flag. 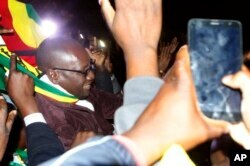 Police spokeswoman Charity Charamba on Wednesday said Mawarire was picked up on an outstanding arrest warrant. "He skipped the country, but as you know, going to America was never going to wash away his crimes. We were waiting for him to return," Charamba said. It was not immediately clear why Mawarire had chosen to return home. Some in Zimbabwe had criticized him for leaving the country amid the protests. At the time, he said he feared for the security of his family. Before he left Zimbabwe, Mawarire was detained and initially charged with inciting public violence before prosecutors changed the charges to attempting to overthrow a constitutionally elected government. A magistrate freed the pastor after ruling that it was unconstitutional for prosecutors to bring the fresh charges in court. Amnesty International's deputy regional director for southern Africa, Muleya Mwananyanda, has called the latest charge against Mawarire "absolutely ridiculous and a total sham," saying it was meant to "punish him for speaking out about the declining human rights situation." Mugabe has said Mawarire and others should leave Zimbabwe if they were unhappy with the country's situation. The economy of this once-prosperous southern African nation has crashed, and both unemployment and frustration are widespread.